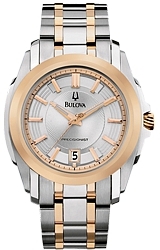 The Men's Bulova Longwood Precisionist Watch, model 98B141, is an exceptionally handsome men's watch with Rose Goldtone Accents on aStainless Steel Case & Bracelet. It is a men's large dress watch with a date window at the 6 o'clock position. The Rose Goldtone and Silver three dimensional dial is covered by a curved hardened mineral glass crystal that resists scratches. The watch is water resistant to 100 feet below sea level for everyday trouble-free wear. All of the watches in the Bulova Longwood Collection are handsome dress versions of the astonishingly accurate Bulova Precisionist Watches. 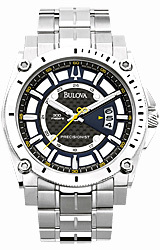 The Bulova Precisionists are the most accurate watches in entire the world with smooth sweep second hands. Precisionist Watches are accurate to within 10 seconds per year.